Waking the sleeping giants. All across the country, college campuses are yawning and stretching, stirring after a long dormant period. Students — ever the savvy consumers — are objecting to their use as unwitting pawns in the new exploitative global economy. 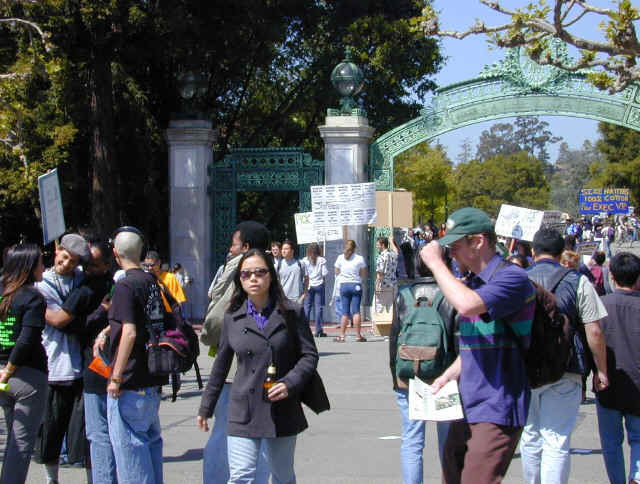 Sit-ins and teach-ins are in this spring, with students demanding that universities investigate working conditions before signing purchase contracts. Public accountability is the watchword, and the main targets are lucrative contracts for athletic clothing (with prominently displayed logos providing free advertising) and college memorabilia. The latest entry into the fray is the University of Oregon where, the Eugene Register Guard reports, police have arrested twelve protesting students, including the student body vice president and next year’s president-elect. Meanwhile, United Students Against Sweatshops, an international coordinating body that includes more than 100 campuses among its members, is keeping a tally of schools that have agreed to contracting codes of conduct. First on the list was Oberlin, in May 1998. Others including Wisconsin, Michigan, and California followed, usually in response to well-organized pressure from their students. Meanwhile, students at tiny Quaker-run Earlham College in Richmond, Indiana have become active on two fronts. They have joined forces with faculty and staff members to obtain a living wage for all Earlham employees. (In Richmond, it takes a full-time income of $9.00/hour to keep a single-income family above the poverty line.) Earlham’s employees voice the aspirations of low-income workers in San Francisco and throughout the rest of the country: "My concern is to make a living wage so I don’t have to work two jobs. I also see that we are not respected in the eyes of management." In addition, the students have discovered that their college is linked to the wretched world of privatized prisons through its food service, which is contracted to Sodexho Marriott Services. Through a little digging, they turned up a complex web of connections: SMS — which also provides meals to a slew of other schools, including UC Santa Cruz — is controlled by Sodexho Alliance, the largest shareholder in the ever-expanding Corrections Corporation of America. SMS’s contract with Earlham is up for renewal. If these students have anything to say about it, the college will find another purveyor. They’ve already begun to make their position known: A recent email says, "On Tues. April 4th, in solidarity with National Student-Labor Day of Action, we organized a boycott against Sodexho. Supported by Student Government, we encouraged students to pledge to skip all their cafeteria meals, especially lunch, during which we provided free pizza on our Quad. There were less than 100 people in the cafeteria during lunch. We deemed it a success."